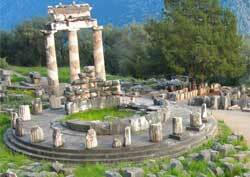 Delphi was one of the ancient world's most sacred sites. It was famous for its oracle. Today, Delphi is a remarkable complex of historical ruins. The Oracle at Delphi was easily the foremost one in ancient Greece. Common folks and kings from distant lands traveled to the site to have their questions answered by the Greek god Apollo. Visitors posed questions through a medium to Apollo. They could range from personal ("Should I plant more olive trees?") to serious matters of state. Delphi priests would then translate the prophecy for the eagerly waiting pilgrim. The reply to a king's "Should my country battle the Persians?" query was "A great kingdom will be destroyed." The monarch thought that the noun referred to his enemy the Persian kingdom - and so he went to war. It turned out it was his kingdom that was destroyed.